Recently a friend brought to my attention a delightful collection of William Safire’s articles from the New York Times Magazine. Many years ago, my friend wrote Safire regarding the origins of the word “trivia”, which the celebrated journalist had mistakenly attributed to the Latin tri via – the meeting point of three roads and, according to him, a spot where mundane events were bound to happen. The correct etymology appears in the next paragraph, but the mention of this particular oversight is in no way intended to diminish Safire’s body of work. His contributions to the column “On Language” spanned more than 30 years and 1,300 installments of witty, erudite, and at times pugnacious, hair-splittingly good times in the world of English usage. Published in 1980, this eponymous compilation chronicles one year of Safire’s call-and-response with his audience, pairing each article with cheers, jeers, and unexpected insights. Here you’ll find three amusing notes from Safire’s well-read readership. They are as relevant now as they were 35 years ago. The correct etymology of “trivia” points to a later origin: the Middle Ages. At the time, university studies consisted of the seven liberal arts and were divided into the trivium and the quadrivium. 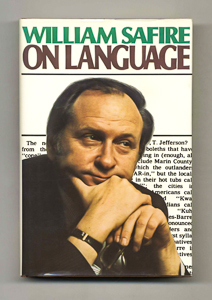 William Safire’s ‘On Language’ is one of my favourite book and read many times. It is on my bookshelf under translation. For celebrating the trivia is used often.